It was a special day, Sunday 14th April 2013, in the town of Sittingbourne in the English county of Kent.The family meets to celebrate the 80th birthdays of two most notable sisters, Diane SCHÖLER and Rosalind CORNETT; the Rowe twins. Nowadays, Diane SCHÖLER is the President of the Swaythling Club International, the organisation responsible for arranging the extremely well attended biennial World Veteran Championships.However, for the twins, born on Thursday 14th April 1933, it is by the maiden name that they became famous both within the sport of table tennis and beyond the discipline’s boundaries. Search through your Christmas presents for a sporting annual in the 1950s, usually the Eagle Annual and you would find a photo and reference to Diane and Rosalind Rowe; the most popular being accompanied by a greyhound dog, as together they leapt over a well position hurdle. The reason for their continual inclusion was that they were World champions. 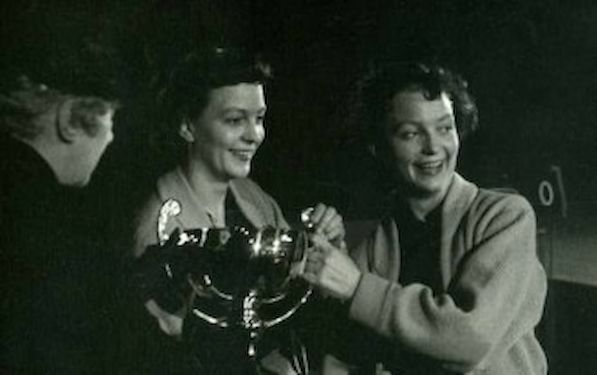 In 1951 on their debut in the World Championships in Vienna, they won the Women’s Doubles title beating Romania’s Angelica ROZEANU and Sari KOLOSVARY in the final; they regained the title in 1954 at the Wembley succeeding in an all British final. They overcame Ann HAYDON and Kathleen Best to secure the crown; later Ann HAYDON turned her attentions to tennis, as Ann Jones she won the Women’s Singles title at Wimbledon in 1969. Twice the gold medallists and three times the duo secured the silver medal in the Women’s Doubles event at a World Championships, the left handed Diane and right handed Rosalind proving an ideal pairing. In 1952 in Bombay they were beaten in the final by Japan’s Shizuki NARAHARA and Tomie NISHIMURA, one year later in Bucharest they were defeated by Hungary’s Gizi FARKAS and Romania’s Angelica ROZEANU; whilst in 1995 in Utrecht they suffered at the hands of Romania’s Ella ZELLER and Angelica ROZEANU. In fact Diane, finished as the Women’s Doubles runner up in a World Championships on no less than five occasions. In 1957 in Stockholm with Ann Haydon when beaten by Hungary’s Livia MOSSOCZY and Federal Germany’s Agnes SIMON and in 1963 in Prague with Mary SHANNON. The duo experienced defeat at the hands of Japan’s Kimiyo MATZUSAKI and Masako SEKI. Outstanding at table tennis, Rosalind later turned her attentions to golf. My first teaching post was at Slade Green Secondary School in south east London, the suburb bordered Kent. I started a table tennis club for the pupils at the school. One of English teachers was Mrs Smith; she explained to me that she played golf with a lady who once played table tennis. She explained her friend’s name was Rosalind CORNET and that she’d been a world champion. “I did not recognise the surname and treated with the remark of something like “pull the other leg it’s got bells on”. Mrs SMITH returned to school on Monday morning after a weekend’s golf; she explained she’d asked her friend about table tennis and that her maiden name was ROWE. “Have you heard of her?” The kindly English teacher asked? I must admit I was dumbfounded; I think I asked Mrs SMITH about ten times to confirm it was the one and only Rosalind ROWE, the sister of Diane”. Together they became sporting stars in England; everyone who liked sport had heard of the Rowe twins. They were superstars of their era, true ambassadors for table tennis.